As we near the halfway mark of this academic year, we look back over 2016 with pride in our past and confidence in our future. We congratulate and honor our founders, the Sisters of the Holy Cross, who celebrated two anniversaries this year: the 175th anniversary of the founding of their order and the 130th anniversary of their having arrived in Columbus in 1886 to administer the then new hospital, Mount Carmel West. To Keep Using Your mccn.edu Email, TAKE ACTION NOW! 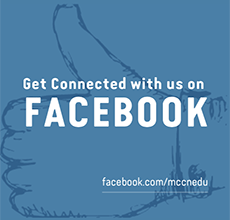 If you have an mccn.edu email, you’ve received information on the new 2-step Verification process. If you wish to continue using this email – which we hope you will – you will need to complete the required 2-step Verification process before December 1 (see instructions below). If you choose to use a different email address instead – please send it to alumnioffice@mccn.edu so you won’t miss out on upcoming news! 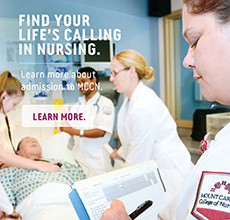 Read more: To Keep Using Your mccn.edu Email, TAKE ACTION NOW! Regina Sallee Williams (’52), PhD, MSN, RN, FAAN (right) was greeted by Shirley Cooley, PhD, RN, CNE, C-EFM, associate professor, at the Scholarship Dinner. Dr. Williams, who was Distinguished Alumna in 1996 and retired as head of the Department of Nursing, Eastern Michigan University in 2001, was in the first class to graduate African-American students. In 2002 Dr. Williams established the Regina Sallee Williams Scholarship for Minority Students, a highly sought honor for MCCN students. The 50-year Honor Class – the Class of 1966 – enjoyed Homecoming activities. Professional Highlights: I am currently a travel nurse with Aya Healthcare, one of the largest travel nursing companies in the country. Today I’m working on a med/surg unit at St. Luke’s Meridian Hospital in Meridian, Idaho. Before joining Aya, I gained experience at OhioHealth, first in the Med/Surg Fellowship Program at Riverside Hospital where I worked in neuro and cardiac care and later in the trauma unit at Grant Hospital. Other degrees/credentials: I earned a Bachelor of Science in Nursing (BSN) in 1989 and a Master of Science in Nursing (MSN) in 1992, both from The Ohio State University, College of Nursing. In 2009 I earned my Doctor of Nursing Practice (DNP) from the University of Minnesota School of Nursing. My credentials include ACNS (Adult Clinical Nurse Specialist); NEA (Nurse Executive Advanced) and APRN (Advance Practice Registered Nurse, license).